Colin’s story… | Cartref Ni - My Home. My Life. My Choice. 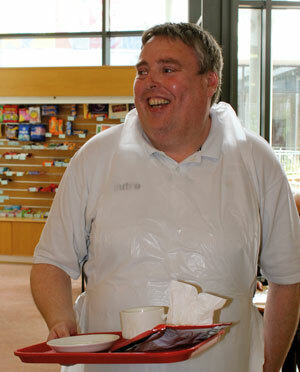 Colin enjoying a busy day at work in the Hospital Tea Bar. With Cartref Ni’s support, Colin enrolled on a “Work Preparation Course”. This helped Colin gain the skills he needed to complete an interview. He started volunteering with the support of a job coach. He made such excellent progress that he soon achieved his ultimate goal of becoming independent enough to work without support. Cartref Ni have also helped Colin plan a visit to Anfield to watch his favourite team, Liverpool. As his confidence has grown, Colin has become more involved in planning his finances and making decisions about leisure activities, such as holidays. If you or a family member is already a Cartref Ni service user, we’d love to hear from you! Click here to submit your news of what you’ve been up to recently. We’ll publish a selection on this section of our website. If you’d like to talk to us about how Cartref Ni can help you or someone you know, visit our Get in Touch page. We’ll be in touch with you within 5 working days.